This hilarious adaptation takes stock Commedia del'Arte characters and reimagines them as archetypes from 1930s gangster films. Set in Prohibiton-era Chicago in the 1930s, this version finds an aspiring wiseguy in a heap of trouble when he finds himself working for both a beautiful woman disguised as her brother and the brutal Public Enemy Number One who is trying to become a reformed man. Throw in two rival mob bosses, a switchblade-toting hood and a gun moll with a food fetish and the result is a delightful whirlwind of romance and laughter. This adaptation is available in an updated version titled A Piece of the Action. This adaptation requires the production of two newsreel films and contains three musical numbers. The updated version titled A Piece of the Action does not require the newsreels or the musical numbers. Reviews "Jon Mullich has adapted Carlo Goldoni's classic Italian farce, Arlecchino Servitore di Due Padroni, and has written wonderful parts actors can sink their teeth into, making for an enormously fun and satisfying production." 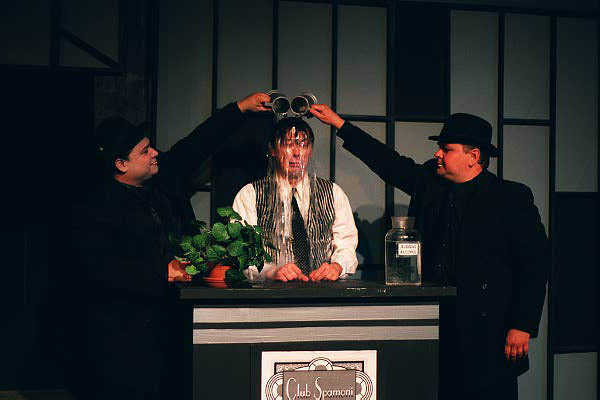 "Jon Mullichs witty albeit loose adaptation of Carlo Goldonis classic comedy successfully transplants the setting from 1750s Italy to Prohibition-era Chicago. The source of the production's charm is its continual motion and comic invention."